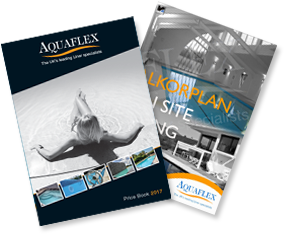 Aquaflex has revolutionised what can be done with a pre-tailored pool liner. Gone are the days when anything out of the ordinary was deemed impossible. Aquaflex has pioneered the incorporation of lined steps into pre-tailored liners. The benefits are enormous, for both renovating old pools and incorporating into new pools where a less expensive option than a fibreglass or acrylic step is needed. Matching the colour of the liner to the colour of the step ceases to be a problem. Almost any size and shape of step can be lined in this way, as long as clear and accurate drawings are supplied. The only stipulation is that there must be an absolute minimum of 6″ (0.15m) of water covering the top step in order to prevent movement of the liner. The sketches below give an idea of the selection of step designs that is possible. Step edges should be finished with a very small “pencil” radius to prevent sharp edges and sand bags or other ballast should be used during filling to help keep the liner in position.